How would you describe Urahara and Yoruichi's relationship? What's your favorite crack/often forgot about couple? Do you think Nemu Kurotsuchi is HOT? The fans pick: Yep. Really. (For Guys) Who do you think is the hottest? Please read them all before deciding. What would be the new evil's objective and what would they want to get from their operation in Bleach? Why do you think Fanpop, and Bleach club, is so dead? A very very old story I wrote several years ago. Only just now, have I finally gained the courage to post it here. My accuracy of how I portrayed a lot of what I wrote may or may not be that much but it was written with how I perceived things. I understand interpretations are not always correct but I really hope this was as close as possible to maybe being at least a little. Also the title might not be too fitting.... Well despite that I hope you like it anyways. "This Article Contains Spoilers Took Place After bleach manga Left Off "
Bleach: Can’t Fear Your Own World will be released on the 4th of August 2017, on Jump j Books. This new novel follows on on Bleach manga, it’s created by Durarara! !’s author Ryohgo Narita, which will be serialised every other Friday on their Jump+ digital platform. New visuals and the novels antagonists are also shown below! This year's 35th issue of Shueisha's Weekly Shonen Jump magazine is revealing on Monday that the next game inspired by Tite Kubo's Bleach manga will be for the LINE social media and messaging app. The game, titled Bleach: Paradise Lost, is slated to launch for iOS and Android devices this year. The "Bankai 3D tag role-playing game" will be free-to-play with in-app purchases. In the game, players will become Shinigami (Soul Reapers) to protect the real world from Hollows. The game will use GPS location data to allow players to defend their own neighborhoods from Hollows. The official Bleach website for the upcoming Live-Action Bleach film posted up a teaser trailer for the upcoming movie today. The teaser trailer displays Ichigo Kurosaki (Shinsuke Sato) gaining Shinigami abilities and cutting of a Hollow’s hand. The film will centre around the Substitute Shinigami Arc which was the manga’s first, running from volume 1 to volume 8. We’ve known that Bleach manga is in its final arc, it seems as though the time has come as Bleach 685 will be the final Bleach manga chapter! Weekly Shonen Jump 35 seems to have posted the ending notice in Bleach 684 as a colour page and climax will be featured in Bleach 685. This is a fan fiction I wrote for a local contest that it won. A friend of mine, wanted me to upload it to here so she might read it. I will be doing it in chapters so it's not to much to read all at once hope you enjoy. So without further ado let's explorer the origins to our favorite story. 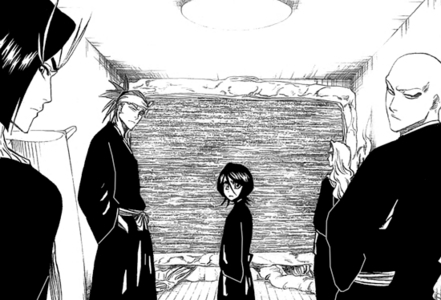 an answer was added to this question: Do you think there is a Real Soul Society and Hueco Mundo? a reply was made to the forum post: Create Your own Shinigami!